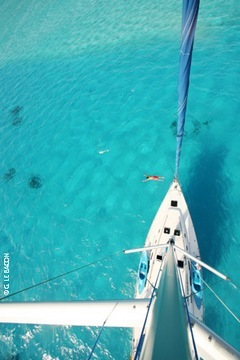 RAIATEA YACHT is a broker selling used power and sailboats in the Polynesian area. The company has reinforced its leadership for several years on the Polynesian market. The firm has been launched in 2008 in Raiatea, capital of Leeward Islands, French Polynesia. Raiatea is a major port of call for many of the sailors crossing the Pacific Ocean or wishing to start a long journey from there. Thanks to this sail flow, the number of power and sailboats for sale on the website is constantly fueled. Every ship for sale on the website is located in French Polynesia but also in New Caledonia, New Zealand, Australia and other places in the Pacific. The global dimension of the activity is strengthened by an affiliation to YACHT WORLD : sales are closed for buyers from France, Europe, North and South America, Australia and Asia. Monohulls and multihulls, amateur-built or shipyard, new or used powerboats, RAIATEA YACHT proposes a wide range of boats meeting the needs of sea-lovers. RAIATEA YACHT is the partner you can trust to make your dream come true. "We favour the relationship with our customers whether they are buyers or sellers to satisfy their needs the best we can." Sea-dedicated, sailer, Alexandre is been raised and soaked up in yachting since childhood. At first he's been contributing for several years to the family company, a dry-dock/maintainance shipyard in Granville, Normandie, then has been a dealer for several renowned yachting brands, such as Big Ship, Dufour Yachts, White Shark, Selva and others, and ran a yacht charter company. In 2012, he discovered French Polynesia aboard his sailboat, and sailed for 2 years in Polynesia and South Pacific. Taking over Raiatea Yacht is now the natural way to unite his two passions; Polynesia and yachting. In order to get in contact easily, Alexandre has gathered a team to represent RAIATEA YACHT in the Pacific area: Aurore and Clémence (Tahiti/Moorea, French Polynesia) and Thierry (New Caledonia) support you.